Peter Sagan official application. 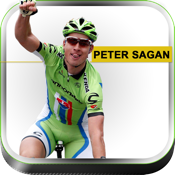 Peter Sagan (born 26 January 1990) is a Slovak professional road bicycle racer . Sagan had a successful junior mountain bike racing career, winning the Junior World Championship in 2008, before moving to road racing. Sagan is considered one of cycling's most promising young talents, having earned many prestigious victories by just his early twenties.